J. Kalu Osiri is the President of IADE (since 2012) and co-founder of the Journal for the Advancement of Developing Economies, which published its fifth volume in 2016. Dr. Osiri brings strong vision and thought leadership to IADE and has positioned the organization to function as change agent and as a conduit of change in Africa and other emerging markets. Dr. Osiri is an Associate Professor of Practice in Management and Director of International Business at the University of Nebraska-Lincoln (UNL). Prior to arriving at UNL, he was a business faculty at Washington State University-Pullman. On a mission to develop students into global leaders, he leads them on high-impact global immersion programs, where they work on assorted international projects for companies and countries. While at the helm of the UNL International Business, he has been instrumental in growing enrollment and interest in international business, securing and managing privately endowed funds and pledges for international business, recruiting exceptional staff persons to support growth, and dramatically deepening the international engagement of the business community in the college. He has also launched new academic and co-curricular programs in international business, including the Distinguished Scholars Program, to enrich student experience and therefore making the International Business Program more competitive. In 2016, he led a group of business and engineering students to assist a women initiative in Uganda. Later that year, he led another multidisciplinary group to tackle a sustainable entrepreneurship project in Panama. In 2017, he co-led another group that developed an eco-tourism plan for the Office of the Vice Presidency, the Ministry of Indigenous People, and the Ministry of Tourism in Guyana. 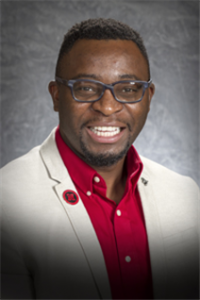 In 2017, he was co-author of a Young African Leaders Initiative proposal, which brought Washington Mandela Fellows to UNL through a US State Department grant. Osiri teaches graduate and undergraduate courses in International Business, Global Leadership, and Entrepreneurship. His research interest broadly spans two areas. The first area is concerned with understanding how culture and institutions influence entrepreneurship and innovation in societies. The second is concerned with leadership, human development and sustained, desired change. He is the author of Unleashing Your Idea: Steps to a Successful Start and Entrepreneurial Marketing: Creating a Customer Base. Osiri is a graduate of the Grambling State University (BS), Louisiana State University (PhD), The University of Florida (Post-Doctorate), and the Harvard Management Development Program (MDP). Prior to joining IADE as Director of Research and Associate Editor of the Journal for the Advancement of Development Economies, Dr. Theophilus (Theo) Udeigwe, a scientist and educator in the fields of soil and environmental sciences, has held a number of positions with significant research, teaching, managerial, supervisory, outreach, and international responsibilities in different university systems in the United States. As a scientist, Dr. Udeigwe has led several research projects in the areas of environmental soil chemistry, soil fertility and nutrient management, water quality, soil/water remediation, row crop production, and crop water management. He has worked on various soil types and in different climates (tropical, humid, and semi-arid/arid). Findings from his studies have been shared through 32 peer-reviewed scientific publications, 25 published abstracts, 12 other presentations, and seven technical reports. Dr. Udeigwe has secured and managed over $650,000 in external grants from various competitive sources (government and private industry) in the recent years and has collaborated with 45+ research fellows all over the world. As an educator, Dr. Udeigwe has designed and taught courses in environmental soil chemistry, soil fertility and nutrient management, and soil and water sciences at undergraduate and graduate levels. He has mentored and served on committees of over a dozen graduate students and advised 50+ undergraduate students. Dr. Udeigwe has run programs with international components and engaged in significant international scholarly activities with peers in Botswana, China, Egypt, Jordan, Kenya, Nigeria and South Africa, with over a dozen peer-reviewed scientific publications resulting from these collaborations. He is a two-time recipient of the prestigious Carnegie African Diaspora Award by the Institute of International Education, sponsored by the Carnegie Corporation of New York, to assist in enhancing the quality of graduate agricultural programs in African Universities. He has also obtained grants from the US Department of Agriculture and US Agency for International Development, aimed at hosting and training international scholars and has mentored students and scholars from Brazil, Egypt, Germany, Ghana, Liberia, and Syria. Dr. Udeigwe has an M.S. and a Ph.D. in Agronomy (Soil and Environmental Chemistry) with a minor in Civil/Environmental Engineering from Louisiana State University. He is a reviewer for four international journals, and an active member of the American Society of Agronomy, Crop Science Society of America, and Soil Science Society of America.